Michael Bublé is a multi-million selling Canadian singer who recorded 4 albums before he decided it was time to sing a complete album about his self-professed favourite time of the year (he has also admitted that 'Miracle on 34th Street' is one of his favourite movies). 'Christmas' is due later this year (so watch out for our review!) and will include several duets with the likes of country star Shania Twain (on an upbeat version of 'White Christmas') and latin singer Thalia. There will also be covers of 'Jingle Bells', 'Blue Christmas' and Mariah Carey's 'All I Want For Christmas Is You' and a brand new song called 'Cold December Night'. 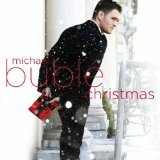 Prior to his festive record Michael Bublé had released an EP called 'Let It Snow' which contained 4 perennials 'Let It Snow, Let It Snow, Let It Snow', 'The Christmas Song', 'I'll Be Home for Christmas', 'White Christmas' and an original song written by the EP's producer David Foster called 'Grown-Up Christmas List'. Bublé brought his usual swing, albeit a lot softer than normal, to ensure the good times pervade throughout. Oddly the title track is the weakest of the 5 with the singer sounding as if he is trying too hard to upstage those who have performed the song before him. Thankfully, 'The Christmas Song' is much more controlled with Bublé relaxed enough to usher in a unique take on the classic. 'I'll Be Home For Christmas' slows things down considerably with Bublé offering his own unique heart-wrenching stamp on proceedings. 'White Christmas' continues in a similar vein with a piano flecked backdrop offering a sonic snow-falling setting. Closing track 'Grown-Up Christmas List' may break the mould of the preceding tracks but it proves to be the EP's highlight with the singer finally unleashing his famous range in a emotional soaked performance. In 2009 Michael Bublé sang a duet with American Idol star Jennifer Hudson which comprised of a medley of 'Baby, It's Cold Outside' and 'Let It Snow, Let It Snow, Let It Snow'. The song made it on Hudson's Christmas special and you can watch the video of the performance below.